Now that we are no longer in the throws of winter's chill with the ice, snow, and sub-zero temperatures, a no-so-young woman's thoughts of fancy turn to biking. As soon as it warmed up I began biking from my house to the train station in Collingswood. It's easier all around for me to ride the one mile with no hassles trying to find a parking spot. No wasted gas on such a short trip. Bonus, I get ten minutes of exercise twice a day. Not quite enough but better than nothing. I'm not able to bike too far these days since my back has been such a mess of fractures, impinged nerves, herniated discs. 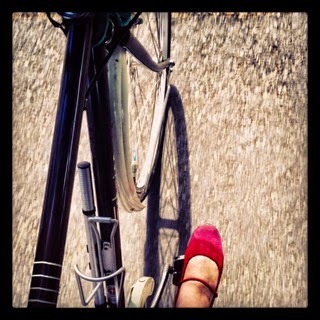 I had to sell my road bike because I can no longer be hunched over the handle bars; I need a ride that keeps me upright. I have two other bikes that fit this mode so the road bike went to a better home. It was sold to a woman I know who's athletic and appreciated a well-maintained bike. I'm sad, real sad. It's a chapter of my life that's over and it makes me lament what once was. Of course I can't stay in this mind frame. Gotta look to the next chapter I suppose. There's always the gentle ride around town, both in Collingswood and in Philly. I can't ride into Philly like I used to do a few years ago, I cannot carry the bike up the steps of The Ben Franklin Bridge or even up and down the steps of the PATCO train. Unless I were to drive into town and bring my bike with me in the car, I have not had a bike to ride in Center City for over two years. 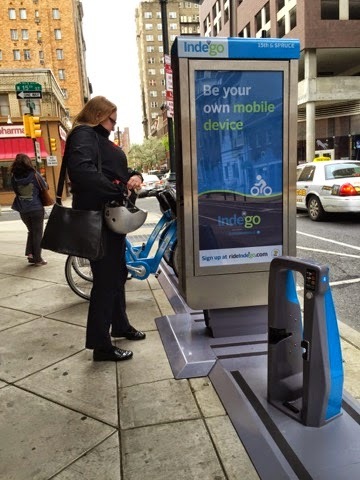 Enter the Indego Bike Sharing program in Philadelphia. "I've opted for the $15/month plan, and since all my rides so far have been about 20-25 minutes, not hitting the hour-per-ride threshold, I've not paid anything other than the $15 monthly flat fee. It's really a great deal for commuting"
A third option which I joined is a $10 annual membership and paying $4 an hour as a pay-as-you-go option. Once I read through all the legalities, debated on the merits of the program, mulled over the $1,000 liability claim waive should something happen to the bike, I decided that for my limited needs doing the pay as I go method was for me. I now keep a spare bike helmet at my office for the spur of the moment errands and jaunts I may take throughout the spring and summer. There was a lot of consideration done on my part before I joined the bike share program. My biggest issues are that this is a casual rider program, seemingly geared toward the tourist rider. The rules of engagement are that once you remove a bike form the dock, you don your helmet (although wearing a helmet is strongly encouraged and HIGHLY encouraged by me, helmets ARE NOT provided) you ride around and then dock the bike at either the same location another station. 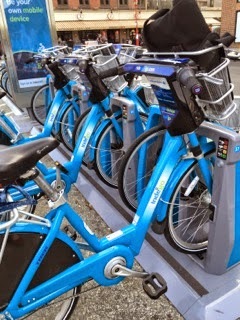 The bikes are not meant or allowed to be left, locked or brought into another space except for an Indego docking station. This bothers me on a few levels. Should I need to run an errand down to South Street, a few miles from my office, I couldn't bring my own lock with me that day and then lock the rental bicycle outside of a store. If there's a dock station relatively nearby then I can ride form station to station. All well and fine for mapped out errands. Last night I took my inaugural ride, picking up a bike at 17th and Pine Streets, riding down Pine Street to South Street. I planned the excursion in advance, bringing my bike helmet with me into the city so that I could have it at the ready for the entire day and evening. After my leisurely ride down Pine and South Streets, I docked the bike at 2nd and South Streets. I met friends for dinner at 3rd and South, the one block walk back to the restaurant was no different than had I parked my car and walked to the restaurant. I rode a total of 3.15 miles, for 21 minutes and was charged $4. Cheaper than a taxi or Uber ride, faster and more convenient than had I walked saving me a lot of back pain! The bikes are comfortable, easy to get on (a new consideration for me these days with all of my back issues and stiffness). the bikes are a bit heavy but I'm used to riding sturdy weighted bicycles. I've spoken with a few people about the program. One woman I met, Jennifer B., an attorney and bicycle advocate, said she loves the program and didn't mind the fact that even though she had to walk a few more blocks to her home from the end--point stopping dock kiosk, she wanted to support the bike ride-share and it was more convenient to her than riding a bus from Center City to her home in the Spring Garden area. 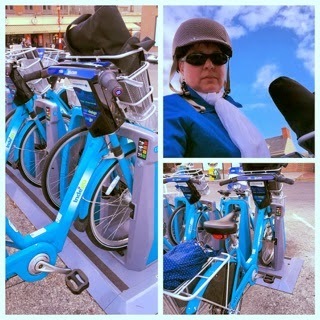 A friend from Collingswood, Katie R, takes PATCO to Center City, picks up a bike at a location somewhere along the PATCO station stops and then rides up to her job in University City. Katie checks the B-Cycle app on her phone to see which station has bikes available before she goes to that location. Katie says that the program has been smooth sailing with the only snags so far being that once or twice the kiosks didn't have a bike available even though the app indicated that a bike was waiting for a rider. I'll have to try this out a few more times before I can fully endorse the program but so far so good based on my one ride and the experiences I've heard from friends and acquaintances. 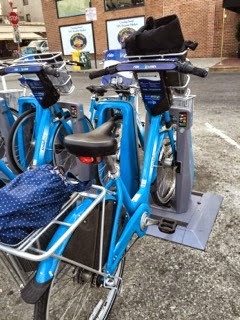 In Collingswood, the bike share program that the Borough has is called Collingswood Bike Share. I've known about the program and location for the 3 1/2 years that we've lived in Collingswood but as I have not had cause to use the program, I never explored the site. You can basically pay a $25 a year membership and "borrow" a bike for the year, renewing each year thereafter. 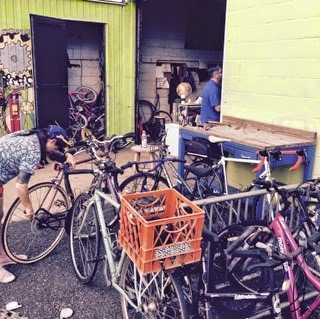 You can come in and work on bikes and the volunteer staff will help you fix a flat, mend a popped chain, even help you re-true a wobbly wheel. There are spare bike parts, tires, cables and all kinds of reflectors through which to sort. 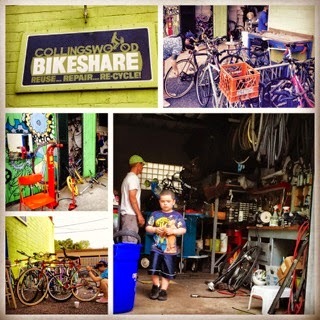 The C'Wood Bike Share is modeled in part on programs like Neighborhood Bike Works, allowing kids to come in, work on bikes and even earn a bike for their services. People "donate" old bikes, parts, tires, etc. so this is the stock from which Bike Share Bikes are re-purposed. One recent Tuesday night I spent the better part of the evening hanging out at the Collingswood Bike Share. I had picked up a tag along bike for my wee lad. The fine dudes and dudette at the shop tried to help me fit it into my bike. No go. They huffed and they puffed but they just couldn't get that tag along to go. No problem señor Joseph Edward Bonaparte Junior did a mighty fine job working on the bike until we realize it just wasn't the right fit. I'll be back and I encourage all my Collingswood friends to support this amazing and hidden gem of Collingswood's bike culture. It's really not fair to compare the two bike sharing/bike riding programs. Bicycles to Mopeds in a way. Yes both will allow you to ride around and get from point A to points B, C, and Z, and each have many merits. I'm a lucky rider to have so many bikable choices in my life; my bikes, a Collingswood Bike Share if I need it, a quick zip around Center City on a rent-a-bike. Bicycle culture is alive and doing very well. Happy to still be a part of it while I can still get my aching tired body around! 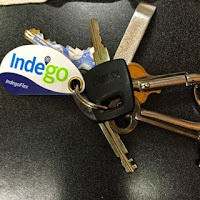 The minute I heard about Indegogo, I thought, "Wonder what Denine's opinion of this is?" As I never got around to writing you, I am so happy you wrote this post! Thanks for the review. I think it's a good thing over all - I mean, how can it not be? I'm sure there will be a solution for a rider like me, who needs the service for errands and not touring. I'm happy it's here. And, as my friend, Katie said, if you sign up for the monthly membership, you can ride a lot for the $15 a month membership if each of your rides is under an hour. Great way to maximize your money and membership! Seems like a workable solution for you, a few more sessions and it will be a habit you'll take for granted. We have a bikeshare in Melbourne (land of Oz) which I've rarely used. We live very close to the city, the nearest station is several blocks from my house, and taking my own bike makes more sense. We are one stop away from the free tram zone too, so I use it when the weather is crap. I have my bikes too, so it's not a service I need much. I'm just happy my city has gotten even more bike friendly. 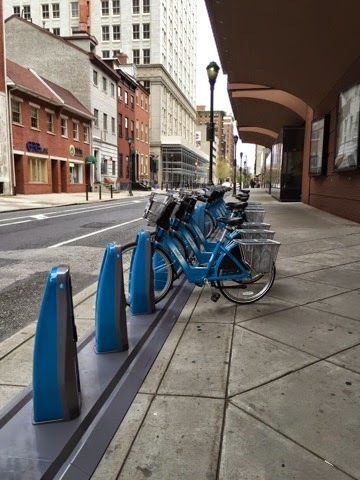 The service has kinks to work out - but slowly we are getting more progressive here in The City of Brotherly and Biking Love!